Put Me Back - Gym Organization No Matter Where You're Located! No Matter Where You're Located. Put Me Back was inspired by the same problems we see at almost every facility, the lack of gym organization. These issues are consistent regardless if your facility is an exclusive country club or local gym. We’ve been frustrated searching for equipment which wasn’t where it should have been because either an inconsiderate member felt it is the gym and other member’s responsibility to clean up after them or some members simply don’t know and follow the lead of others. This eventually had a negative effect on gym organization. Years of dissatisfaction led to the development of a unique, high quality, color-coded, affordable system that aids in the proper gym organization practices. 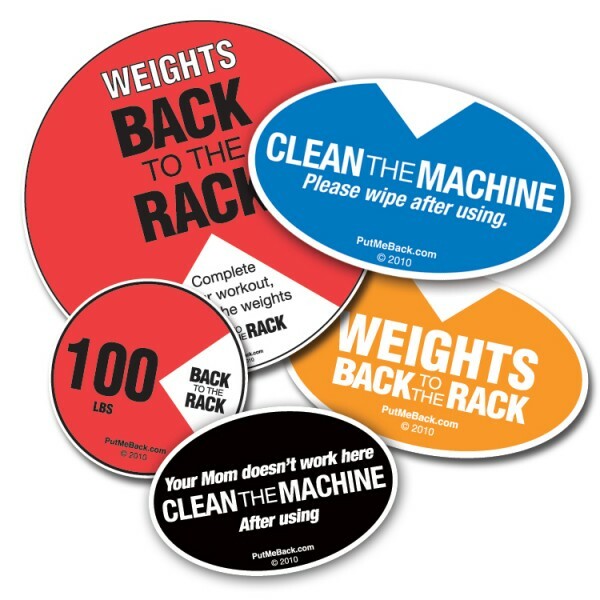 Put Me Back organizes and reinforces the return of weights, dumbbells and other equipment back where they belong. Put Me Back will enhance the appearance of your gym, expedite workout time, and increase positive customer feedback. If you have a presale or general inquiry about our gym organization products, get in touch with us, we’d love to help! You’re showing a potential new member around the workout floor. He seems impressed, and ready to join. Until…He almost trips over a stray dumbbell left on the floor and there goes your new customer! How many times has this happened at your facility? How much time does your staff spend each day, cleaning up after members? How many potential new members have you lost because of a cluttered workout floor, littered with dumbbells and weights which can quickly turn off the most serious prospect? Worse yet, how many times have members or staff been injured, because of equipment left lying around by other members due to poor gym organization? Appearance matters for several reasons. If your workout floor resembles a 5 year olds bedroom, then it is time to take control. Maintaining member loyalty so they can see you are concerned about the facilities appearance will aid in member retention. Maintaining a clean and organized facility addresses the most frequent member complaints. Put Me Back is here to help you with member retention and acquisition, which directly impacts your bottom line. Time to stop the “not my gym, not my problem” mentality. Get Your Gym Organized Today!